* Our sparkling 2 1/4" h x 2 1/2" w Light Colorado & Smoked Topaz crystal floral pin adds bursts of color to bridesmaids, mothers of the bride & prom gowns. * Also, wear this chic pin on sashes, faux furs or in the hair with our comb adapter (sold separately). 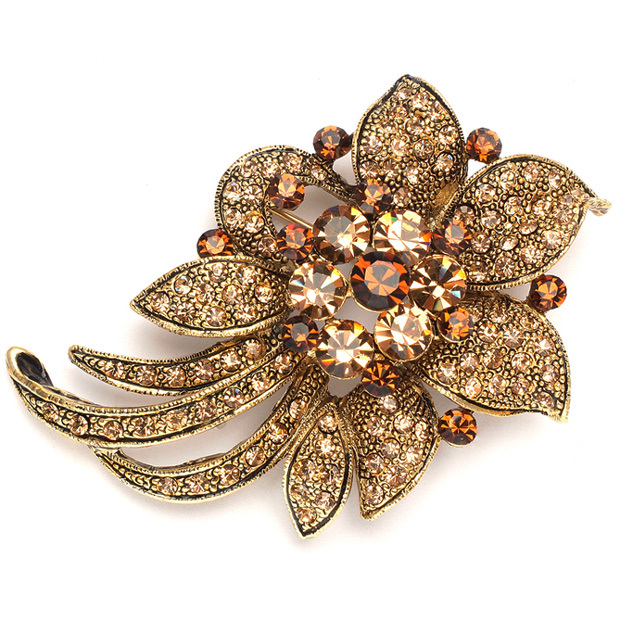 *Add shimmering color to bridesmaids, mothers of the bride, prom & other special occasion dresses with this breathtaking floral brooch from Mariell bursting with Light Colorado & Smoked Topaz crystals. * Our antique gold plated pin can also be added to sashes, faux furs & wraps or worn in the hair with our comb adapter (sold separately)! *Add this popular pin to your store's bridal jewelry display!